Krushi Sevak Bharti is started by Krushi Vibhag, Maharashtra. Krushi Vibhag Bharti 2019 is going to conduct under Maharashtra Mega Bharti. Maharashtra government officially declares about “Maharashtra Mega Bharti” before some days. In the Mega Bharti, There are many departments for which recruitment process will start and these departments come under Zilla Parishad. Krushi Vibhag is also one of the departments for which this Mega Bharti conducting in Maharashtra. In Krushi Vibhag Recruitment, for total 1416 posts inviting to fill the online application form. This recruitment conducting for Group Group “C” level posts. 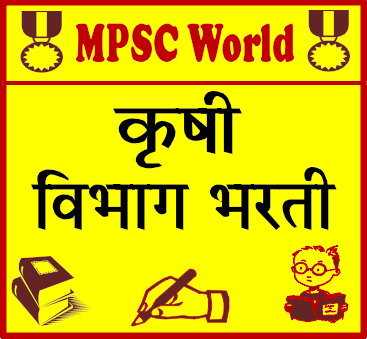 Here we will update you everything about Krushi Vibhag Recruitment 2019. महाराष्ट्र कृषी विभागात कृषी सेवक पदासाठी भरती जाहीर करण्यात आली आहे. ऑनलाईन फॉर्म 5 जानेवारी 2019 ते 25 जानेवारी 2019 दरम्यान भरायचे आहे. सविस्तर माहिती खाली दिलेली आहे. Krushi Vibhag Recruitment is going to conduct in all districts of Maharashtra. Here we are providing all the details regarding Krushi Vibhag Bharti of all districts. Bharti process is still pending in many districts, so there is no link given below regarding pending districts. We will update here when any other district published notification regarding Krushi Vibhag Bharti. Please check below links of your respective district. Krushi Sevak Diploma or Degree in Agriculture or any equivalent qualification. Any Job posts available for Civil engineer?